As we did when barihunk Daniel Okulitch was involved in a car accident, we will try to keep readers apprised of developments concerning Mariusz Kwiecien's injury during a rehearsal of Don Giovanni. Here is the latest update from the New York Times. Mariusz Kwiecien, the Polish baritone who was cast in the title role of the Metropolitan Opera’s new production of “Don Giovanni,” which opens on Thursday night, underwent surgery for a herniated disk on Tuesday, his manager said. “The doctors feel that Mariusz’s prognosis is excellent,” said the manager, William Guerri, of Columbia Artists Management. But it was unclear when he might return to the stage. “It’s a wait-and-see proposition,” Mr. Guerri said. Mr. Kwiecien felt pain during the opening scene of Monday’s dress rehearsal, the manager said. He was taken by paramedics to a hospital, said the Met spokesman, Peter Clark. 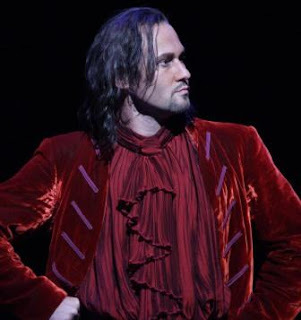 The Met tapped Peter Mattei, who was on hand for a production of Rossini’s “Barbiere di Siviglia,” to replace Mr. Kwiecien for the opening of “Don Giovanni.” The opera has 16 more performances into March, although Mr. Kwiecien was scheduled to be in the cast only through Nov. 11. Celebrating Ned Rorem's 88th Birthday!!! Audun Iversen: Opera Now's "Artist of the Month"
Teddy Tahu Rhodes Sings The "Champagne Aria"
Celebrating the Premiere of "Porgy of Bess"